A short half-elf with the Mark of Storm on her palm, striving to do her best for House Lyrandar. Shaelyn is undersized for a half-elf, standing barely five feet in height with a thin frame. A closer look might hint at the hidden vitality and endurance that belies her small, unassuming build. She has tanned skin, dark green eyes, and long, straight black hair. The Mark of Storm is clearly visible on her left palm. The youngest child and only daughter of Vennic and Alis d’Lyrandar, Shaelyn was born in the island city of Stormhome, the seat of House Lyrandar in Aundair. Though stemming from an obscure branch of the Lyrandar bloodline, Shaelyn’s parents were longstanding members of the Windwrights Guild and raised their children to be as comfortable on dry land as on the deck of an elemental galleon. Expected to follow in her older brothers’ footsteps working as crew or dockside support for the elemental galleons and airships of House Lyrandar, Shaelyn was instead apprenticed into the Raincallers Guild after her Mark of Storm manifested at age thirteen. Though her parents were at first disappointed that her arcane and navigation training would take her away from them and Stormhome, they quickly came around after realizing that Shaelyn would now be in a position to brush shoulders with some of the more powerful members of House Lyrandar in Sharn. 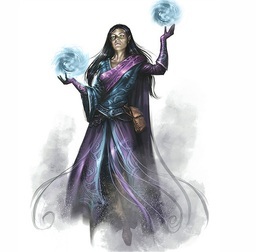 After arriving in Sharn, Shaelyn was set up with one of the masters of the Raincallers Guild to begin her in-depth training. Loraste was considered an expert, though a bit extreme in his teaching methods. Shaelyn was quickly tossed into a “sink or swim” situation to learn a mix of everything – how to control the elements, predict and change the weather, minute details of navigation, and the finer points of sailing. In her off time, she was expected to take geography classes a Morgrave University, and to study the many, many maps in the extensive library. With the end of the Last War and the current state of peace in Khorvaire, the viceroy of Lyrandar’s affairs in Sharn, Solia d’Lyrandar, decided that it was high time for the newest crop of recruits to begin hands-on training. Under the guidance of Loraste, Shaelyn has spent the last few months as an apprentice navigator on several elemental galleons and airships voyaging in and out of Sharn. In addition to gaining practical knowledge of sailing and navigation, these trips taught Shaelyn other important skills. She learned how to mediate between crews and captains, placate angry passengers, and to make small repairs. She also learned more about Baron Esravash d’Lyrandar, the young and bold female head of House Lyrandar, and has dreamed about gaining prestige within the house through discovery of new experimental magic weapons for naval use. After returning from one such trip for a well-earned week of shore leave, Shaelyn bumped into two friends she had made while living in Sharn – Pippin and Rhin. Knowing that they would enjoy a getaway, she convinced the two to (stow away/buy a ticket/whatever fits with their backgrounds). This pleasure cruise will be Shaelyn’s last as an apprentice under Loraste before being conferred the rank of journeyman (above apprentice, below master) within the Raincallers Guild.